- Which one was lighted? - Which one had a heliport? - Which one had a car ejector? - Which sets did NOT have attendants? - Which sets had cars with metal wheels? Our big 50th Issue has gone to press and it will bring to fruition the start of the much wanted, long - awaited Service Station story. We call it "Part One" and these fascinating sets are long overdue for some razor sharp critical assessment and have never been covered before in any medium. Why? The answer is simple. They date back quite a ways, to 1950. We even show a couple from the 1940's. They have been difficult to "nail down" as to contents simply because their variety and number far exceed the number of mint sets available for collectors to catalog and discuss differences. Some of the questions got startling answers. No, the first sets did not get metal wheels. No they did not have attendants! But which ones? Physically, the buildings look similar -- if not exact -- to the ones that do get the figures. So we made it our task to set about the exciting archaeological work of discovering what went with what, which sets get the figures, and so forth. That was the challenge with this issue, and the answers and photos are so all -inclusive that we fittingly had to add extra pages to cover it all. We hope you enjoy going along on the discoveries with PM, assisted by Gary Carlington and some others. For excitement, we bring you the Remco World War One Air Aces set, about as exciting a piece of marketing as we can remember from the Remco firm and this set is a real whopper. In it, a sleepy Allied airfield in France suddenly comes under attack by German Fokker aircraft, circling in out of the dawn sun. A single U.S. Fighter gets into the air and the machine guns chatter as he slams one German into the ground, nose first! Meanwhile doughboys spill out onto the field and another Allied plane, a yellow Nieuport 28, is getting rolled out of a hangar while the third is on the field already, positioned for takeoff when yet another German plane appears. Its all terribly exciting, with some of the finest plastic to appear in the mid-60's, and the packaging tells the whole story as above, all by itself. It is super attractive in colors of blue, red, yellow, and more, an "American Historical" toy. You are going to love this story and you'll be happy to hear another is already being assembled for the follow-up (in this Spring's issue 51). Also here are the big toy show reports for all the recent shows, a fascinating "How To" article on creating rare playset boxes inexpensively, another on expanding your Marx German army by saving certain poses to make into all-new ones for the "Ghost Gray Battalion." For reviews we cover Beau Cunnynghams' brand new and exciting Confederate figures in soft plastic and Jim Clouse's brand new and equally exciting "Battleboards" diorama displays for you to use. Plus take advantage of all the vintage and new soldier production offerings from the SAFEST, MOST RELIABLE DEALERS in the country! And you'll find extra entertainment in our readers' letters, the "My Side" column with a special on Strategic Storage, and more. It's so much FUN! Be sure to join us for the best, most entertaining magazine on vintage toys ever, and the only one in the United States with the best, most accurate info, in depth stories, glossy high quality pages, and full color and BW photographs and full color centerspread. Its the triple WHAM of Vintage Plastic and Toy Soldiers! 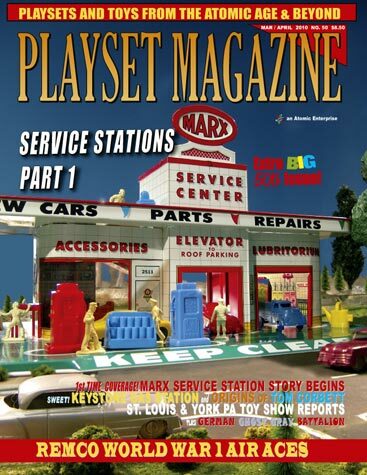 So say "FILL 'ER UP to Playset Magazines 50th BIG ISSUE!